The South China Sea (SCS) has emerged as a major flashpoint in the last two decades. Some Chinese specialists have confirmed that the South China Sea (SCS) may possess approximately 130 billion barrels of oil and natural gas and also dubbed as the ‘Asia’s Persian Gulf.’ Therefore, the dispute in the SCS is accentuated by an abundance of natural resources, and its strategic importance of the Spratly and Paracel islands has again caused conflicts in the South China Sea. Thus, the persistent competition over the maritime rights, especially claims to territorial sovereignty over islands, reefs and natural resources in the South China Sea has emerged as the ‘new central theatre of conflict’ in the world. Therefore, there is no peace and prosperity in the Indo-Pacific region for more than two decades. But, it is also apparent that all the members of ASEAN have a deep interest in keeping peace and prosperity in the South China Sea. Therefore, ASEAN has started involving itself in the issue since the adoption of the 1992 ASEAN Declaration on the South China Sea which was called for the peaceful resolution of the South China Sea dispute. Again in 2002, ASEAN and China had signed Joint Declaration on the Conduct of Parties (DOC) to resolve the South China Sea disputes by peaceful means. Since then, ASEAN as a forum has been trying to resolve and manage the South China Sea dispute by initialising and supporting many frameworks or mechanisms (Track I and Track II) despite many differences among the member states about the issue. 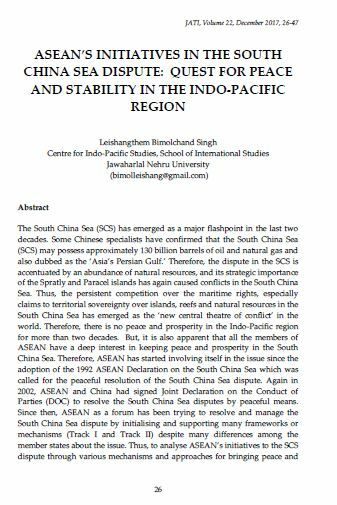 Thus, to analyse ASEAN’s initiatives to the SCS dispute through various mechanisms and approaches for bringing peace and prosperity in the Indo-Pacific region are the main concerns of my article along with its weaknesses and challenges it faces. BIMOLCHAND SINGH, Leishangthem. ASEAN’S INITIATIVES IN THE SOUTH CHINA SEA DISPUTE: QUEST FOR PEACE AND STABILITY IN THE INDO-PACIFIC REGION. JATI - JOURNAL OF SOUTHEAST ASIAN STUDIES, [S.l. ], v. 22, n. 1, p. 26-47, dec. 2017. ISSN 2600-8653. Available at: <https://jati.um.edu.my/article/view/10244>. Date accessed: 20 apr. 2019. doi: https://doi.org/10.22452/jati.vol22no1.3.